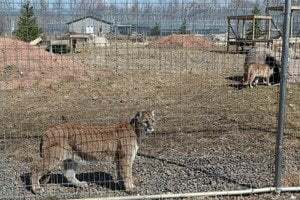 On March 15, CatTime.com reported on proposed legislation that would make illegal for private, non-American Zoo Association (AZA) member facilities to own, possess, or breed big cats such as tigers, leopards, and others. That bill, The Big Cats and Public Safety Protection Act of 2012, probably looks more favorable thanks to the arrival of two such animals at a new facility. Formerly kept in a 300 square-foot garage in Ohio, cougar Tasha arrives at the Wildcat Sanctuary in Minnesota. Nikita, a 7-year-old white tiger arrived at the 8,000 square-foot Wildcat Sanctuary in Sandstone, MN, on Monday. The cat’s first owner, Sam Mazzola used the tiger for photo opportunities, which has taken its toll on the animal. Nikita now suffers from an inconsistent disposition and the sight of strangers and cameras can send the cat into such a frenzy that the animal could inflict wounds on herself. Tasha is another big cat that also lives at the Wildcat Sanctuary. Prior to its new Minnesota digs, the 10-year-old cougar was kept in a garage for nine years. Tasha animal escaped, but its owner didn’t report it was missing, fearing it would be shot dead by authorities. Fortunately, Tasha was re-captured without incident. Both cats resided in Ohio. Parallels to a 2011 incident in Zanesville, where several animals escaped from a wild animal farm and were shot in the name of “public safety,” weren’t lost on animal-rights advocates. Since 1990, big cats have been involved in the deaths of 16 adults and 5 children; 246 maulings; and 254 escapes. Approximately 143 big cats have been killed and 131 confiscated.